Can you save a senior from abuse today? Learn how! Don’t let THIS be your Mom or Dad’s treatment when your back is turned! You can save a senior’s life today! Learn how on The Senior Answer, Saturday morning at 11 on 100.7 KKHT as we share how you can help Adult Protective Services protect seniors from neglect, abuse and exploitation with Rachel Portnoy with Adult Protective Services. No radio? Listen live at www.senioranswr.org or on iHeart at KKHT!!! Do you know of a senior who needs help? You can learn more about Adult Protective Services on line at APS or call their report hotline at 1-800-252-5400. You can also make an on line services referral via the on line hotline at On Line Hotline Reporting. What is the mission of APS? Adult Protective Services (APS) investigates abuse, neglect and/or exploitation of the aged and disabled. When maltreatment is confirmed, APS provides or arranges services to alleviate the problem. Many people who are elderly or have disabilities live alone or are dependent on others for their care. Isolation is a factor that places vulnerable adults at risk for abuse, neglect and financial exploitation. As the population continues to age, APS will continue to see an increase in the number of reports. More than half of all cases reported to involve neglect. Most involve self-neglect. Through illness or diminished mental capacity, vulnerable adults may no longer be able to provide adequately for their own health and safety. They may live in unsanitary conditions, without hear or running water, or may need assistance with meals and other daily activities. They may also require medical care. Once the investigation has been completed, APS develops a service plan to address unmet needs and to ensure the safety and protection of the client. Service plans are developed with input from the client. A client with decision making capacity has the right to refuse services. APS always starts with the least restrictive services. It is not APS protocol to remove a client from their home, this is a last resort applied only when it is a life or death scenario. What do the terms abuse, neglect and exploitation mean? Neglect: is the failure to provide for one’s self the goods or services, including medical services, which are necessary to avoid physical or emotional harm or pain, or the failure of a caretaker to provide such goods and services. Abuse: Is the negligent or willful infliction of injury, unreasonable confinement, intimidation, or cruel punishment with resulting physical or emotional harm or pain. 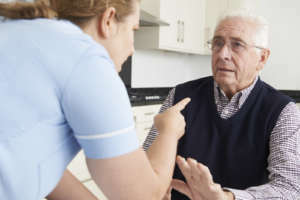 Exploitation: is the illegal or improper act or process of a caretaker, family member, or other individual who has an on-going relationship with a person who is elderly or disabled using or attempting to use the resources of the person who is elderly or disabled for monetary or personal benefit, profit, or gain without informed consent of the person who is elderly or disabled. January 17, 2019 - Are your senior loved ones safe with their paid caregiver? Learn how to make sure! January 4, 2019 - Reduce falling risks for your elder loved one! October 12, 2018 - Medicare crisis growing for seniors! Doctors denying patients needed care under Medicare! August 17, 2018 - Does your aging parent qualify for in home care paid 100% by Medicare? August 10, 2018 - Loved one with mobility challenges? Come listen and learn about some great new solutions! July 13, 2018 - Protect your loved ones from opioid drug addiction! July 5, 2018 - Does it matter who you hire to care for Mom or Dad? You bet it does! Check out these recent news stories!! June 28, 2018 - Osteoporosis… Breaking news on causes and prevention! June 15, 2018 - Your Mom or Dad not so steady on their feet anymore? Are you afraid of them falling and being injured? May 2, 2018 - Fighting Cancer? Want help from someone who truly understands? Listen Saturday morning for help! March 9, 2018 - Incontinence ruining your quality of life? This could be your solution! February 23, 2018 - Questions about dental issues for Seniors? Listen and learn! September 1, 2017 - Confused about your options for help with Senior Care? August 11, 2017 - The Pasadena Senior Expo is this Wednesday! Don’t miss it! July 21, 2017 - Help save lives! Learn how to fight back against the deadly Sepsis Epidemic! June 22, 2017 - Is your elder loved eligible for in home medical care paid 100% by Medicare? Get the answers here! May 13, 2017 - Suffering with Depression, PTSD or after effects of emotional trauma? Join us today and get unstuck to feel better and love yourself again! March 17, 2017 - Having a tough time meeting retirement living expenses? Learn about the Reverse Mortgage solution! January 28, 2017 - Hospice – A scary word for you? Listen and learn how it can help your family when that time comes for your loved one. January 14, 2017 - What if there was a place whose purpose was transforming lives and restoring hope to individuals and families struggling with mental health problems and addiction? December 31, 2016 - Doctors making house calls again? That’s right! December 24, 2016 - Fighting Cancer? Want help from someone who truly understands? Tune in now! December 9, 2016 - Need medical care but have no or little insurance? This could be a solution for you! December 3, 2016 - Struggling to pay for a loved one’s Long Term Care? This may be the answer for you! November 4, 2016 - Do you know about the secret VA benefit called “non-service connected disability pension”? October 29, 2016 - Have you “lost that loving feeling”? October 20, 2016 - Caring for an older parent or spouse? Feel like you are losing the battle to help them, work, help your own family and find a few minutes for sleep too? There are services that can help you care for them at little to no out of pocket cost! October 14, 2016 - You know you need help caring for Mom or Dad or even your spouse but don’t even know where to start? Afraid to even start looking because of the risks and expenses? Well you are not alone! September 30, 2016 - Do you REALLY know what the best choice is during Medicare Open Enrollment? Making the wrong choice can wipe out your life savings! September 16, 2016 - Don’t let Medicare get away with this cut to care! They say it is a miracle cure for fraud but it’s really snake oil! September 9, 2016 - Medicare cutting in home care access for seniors by up to 80% with “Pre-claim Review” program! September 3, 2016 - Medicare reduces patient rights with the MOON Notice! August 19, 2016 - Elderly man’s life saved by Adult Protective Services! August 18, 2016 - Learn how Adult Protective Services protects seniors from neglect, abuse and exploitation. July 29, 2016 - It makes a difference who you choose to care for your aging parent! Learn how to make a safe choice! July 22, 2016 - Emotional Trauma and Recovery… There is hope! July 21, 2016 - Does someone you love suffer with Depression, PTSD or after effects of emotional trauma? Do you feel confused, sad, worthless? Most people can learn to manage emotions, use healthy coping, change behaviors and get unstuck to feel better and love yourself again. July 12, 2016 - Can’t get Mom or Dad in to see the Doctor? Wondering why are fewer and fewer Doctors accepting Medicare and Advantage Plan patients? May 21, 2016 - Medicare proposal puts patients and access to care at risk! March 26, 2016 - Listen live today at 11 to learn more about the warning signs of Alzheimer’s! March 13, 2016 - FREE LEGAL SERVICES FOR SENIORS, ONE DAY ONLY!